The Lunar New Year is upon us, which means it’s time for dumplings. While the traditional bundles of crispy, meaty joy are certainly an acceptable option, the new year is a great excuse to try a few new, indulgent creations from star chefs. The Lunar New Year is upon us, which means it’s time for dumplings. While the traditional bundles of crispy, meaty joy are certainly an acceptable option, the new year is a great excuse to try a few new, indulgent creations from star chefs. Here, five of the most creative takes on dumplings across the country. At Ed Shoenfeld’s RedFarm in New York City, chef Joe Ng doesn’t hold back when it comes to dumplings. There are lobster dumplings, colorful “Pac Man” dumplings and, most famously, black truffle chicken soup dumplings. The giant xiao long bao are filled with heady truffled chicken soup and topped with extra black truffle shavings. Dumpling Galaxy’s compendium of a hundred different dumplings includes more than a few out-there offerings, but one of the most unique is the sweet wood ear mushroom dumpling. Served as a dessert at the New York City restaurant, the mushroom dumpling is flavored with anise and tart hawthorn berries. Pubbelly, Miami’s Asian-inflected gastropub, has dumpling-ized a Reuben sandwich. The pastrami and sauerkraut dumplings include caraway powder to replicate the rye bread and Thousand Island dressing for dipping. Oysters aren’t the only things that can be imbibed via a shooter. At Chaplin’s in Washington, DC, the whiskey a-go-go consists of a pork dumpling served in a spoon perched on a warm, lemony whiskey cocktail. You can dip the dumpling in the drink and eat it, dunk it entirely into the drink and toss it back, or eat and drink everything separately. The foie gras soup dumplings at Annisa in NYC are one of Anita Lo’s most beloved dishes. 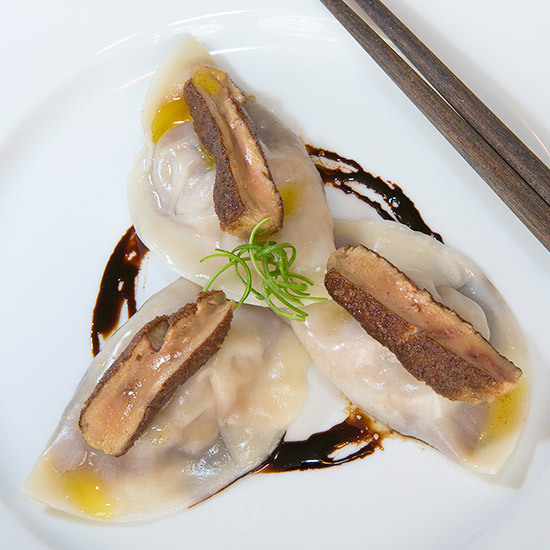 Stuffed with foie gras mousse and jicama, the dumplings are topped with seared foie gras and served with a rich, tart black vinegar reduction.